Overview: Remember those scary movies with creepy castles, mad scientists and cobbled together monsters? 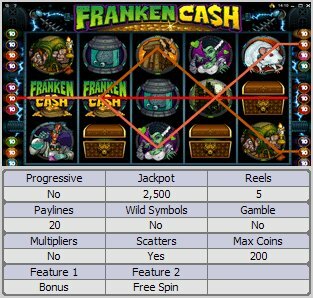 The scary Franken Cash Video Slot is here, and wrapped in a brilliantly executed Franken-theme with great sound effects and scary characters. One can truly pay an electrifying visit to the cranky, but amusing 'spare parts' laboratory with its weird equipment and even stranger staff; from the mad scientist and his ghoulish helpers, to the bride of Frank who really is the sum of all his separate parts. Franken Cash delivers great entertainment and continuous action with wicked Free Spins and an electrifying bonus feature where a choice of three voltage meters out of a possible 12, can send your winnings alight. Similar Slots: If you like Franken Cash, you might like these other 5-reel slot machines: Gift Rap, Kung Fu Monkey, Loaded, Royal Feast, Totem Treasure, Truck Stop.